With a predominant wooden fixture, the cafe is an ideal option when you need a spot for casual lunch and to catch up with your friends. A selection of creative and inspirational magazines are also available for your reading pleasure, making this space an even cosier one amidst the busy crowd in town. The next time you need a cafe option in town, drop by The Assembly Ground. For a start, the Green Tea Latte (S$5.50) is the bomb. We are huge fans of matcha lattes, and becayse there are too many in Singapore that disappoint, we have this constant fear (of disappointment) whenever we order one. But the one here gave us hopes again, and we’ve been in love since. Of course, their regular brews are aromatic too. Cappuccinos and Flat Whites are at S$5.50 each for single shot. On the food menu, they’ve got you covered with appetizers, sandwiches and burgers, salads and soup, pastas and pizzas and brunch food. 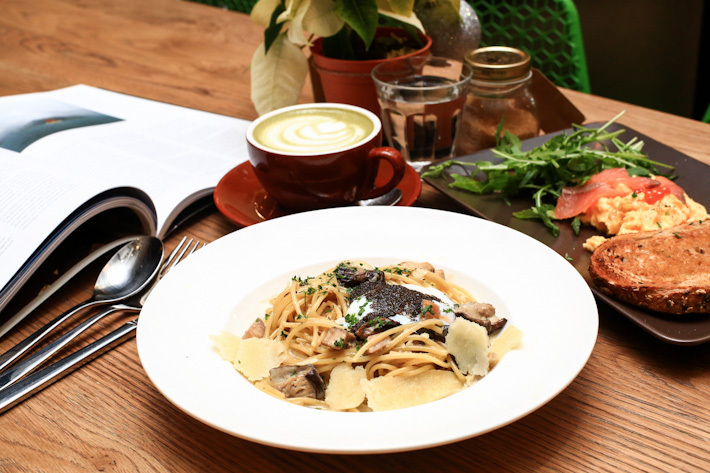 Among the many, the Porcini Cream pasta (S$17.50) deserves a mention. Think a trio of mushrooms, truffle-scented egg and generous amount of shaved parmesan.